Voltage Pictures, a movie company with a reputation for chasing down alleged Internet pirates, is being sued for "blatant" breaches of copyright. After promoting its own version of a Godzilla movie without first obtaining permission from its Japanese owner, Voltage is now being called out as "outrageous in the extreme." There are dozens of companies engaged in so-called “copyright trolling” worldwide, the majority connected with adult movie companies. While most are generally dismissed as second-rate companies out to make a quick buck, U.S. producer Voltage Pictures has developed a reputation for making fairly decent movies and being one of the most aggressive ‘trolls’ around. The company has targeted thousands of individuals in the United States, Canada, Europe, Asia and most recently Australia. The company has largely prevailed in these actions but a new case filed this week in the U.S. sees the company on the receiving end of procedures. The spat concerns Voltage’s plans for a new movie. Starring Anne Hathaway and titled ‘Collosal‘, the flick sees a giant lizard-like creature stomping its way over Tokyo. 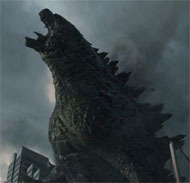 It sounds an awful lot like Godzilla, recognized by Guinness World Records as the longest-running movie franchise ever. Toho, the Japanese movie studio behind the Godzilla brand, noticed the similarities too. In a lawsuit filed yesterday in the United States District Court for the Central District of California, Toho highlights the hypocrisy of Voltage’s actions. Describing the company as a “staunch advocate for the protection and enforcement of intellectual property rights” after filing hundreds of copyright suits involving its movies The Hurt Locker and Dallas Buyers Club, Toho says that Voltage began promoting its new movie via email at the Cannes Film Festival earlier this month. 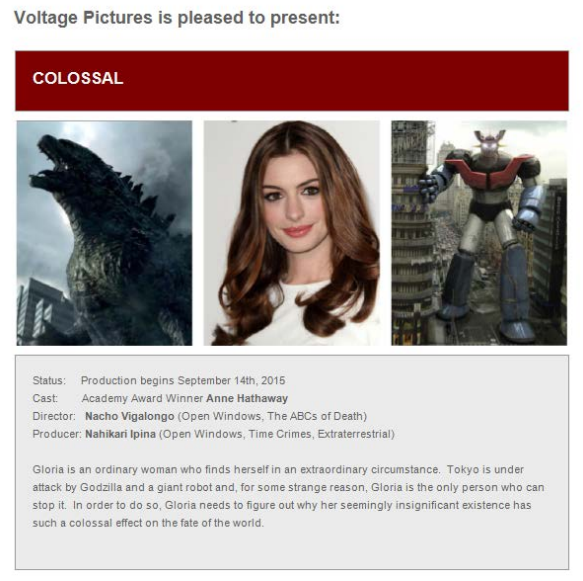 As can be seen from the screenshot below, the email features three large photos of Godzilla, actress Anne Hathaway, and a giant robot. “Gloria is an ordinary woman who finds herself in an extraordinary circumstance. Tokyo is under attack by Godzilla and a giant robot and, for some strange reason, Gloria is the only person who can stop it,” the email reads. Predictably Toho is upset at Voltage’s use of the Godzilla character and associated breaches of the company’s copyrights and trademarks. Only making matters worse is the fact that the image of Godzilla used by Voltage is actually taken from promotional material published by Toho to accompany the release of its 2014 movie, Godzilla. advertising, and selling an unauthorized Godzilla film of their own,” Toho begin. and to obtain financing for their project,” the company continues. Noting that at no stage has Voltage ever sought permission to exploit the Godzilla character, Toho says it asked Voltage to cease and desist but the company refused. “Upon learning of Defendants’ infringing activities, Toho demanded that Defendants cease their exploitation of the Godzilla Character, but Defendants refused to do so,” Toho writes. In response Toho filed suit and is now demanding that all profits generated by Voltage as a result of its “infringing activities” should be handed over to the Japanese company. That, or payment of $150,000 in statutory damages for each infringement of Toho’s copyrights. Trademark issues are at stake too, with Toho demanding preliminary and permanent injunctive relief against Voltage’s use of the Godzilla marks. Being on the wrong end of a copyright infringement lawsuit will be a novel experience for Voltage Pictures. After recently winning a case to reveal the identities of thousands of alleged pirates in Australia, the company is currently engaged in negotiations with a Federal court over how its first letters to the accused should be worded. With a hearing scheduled for tomorrow, the studio is still experiencing resistance against what is perceived as a so-called “speculative invoicing” business model. Local ISP iiNet is providing comprehensive advice to its customers affected by Voltage’s action and is even working with a law firm prepared to provide pro-bono services.